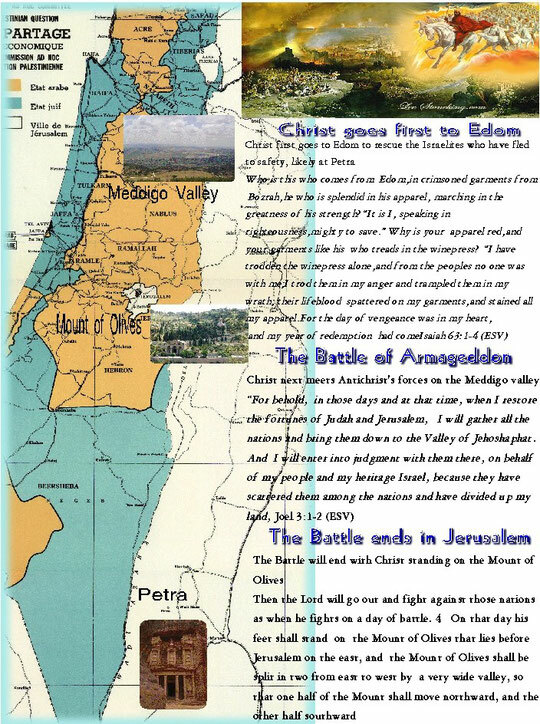 The Battle of Armageddon - hisreturn jimdo page! For God did not send his Son into the world to condemn the world, but in order that the world might be saved through him. Whoever believes in him is not condemned, but whoever does not believe is condemned already, because he has not believed in the name of the only Son of God.. This time Jesus is returning to condemn all those left who do not believe in Him. After defeating Satan in heaven, God has allowed Satan to gather his armies here on earth. Now Jesus will destroy Satan’s armies here. In a series of battles, Jesus will totally destroy Satan’s minions. These verses give us an overall account, and the result of the battle, but more detailed accounts can be found elsewhere in the bible. In Isaiah, we find that Christ goes first to Edom. The burden of the word of the LORD concerning Israel: Thus declares the LORD, who stretched out the heavens and founded the earth and formed the spirit of man within him: “Behold, I am about to make Jerusalem a cup of staggering to all the surrounding peoples. The siege of Jerusalem will also be against Judah. On that day I will make Jerusalem a heavy stone for all the peoples. All who lift it will surely hurt themselves. And all the nations of the earth will gather against it. On that day, declares the LORD, I will strike every horse with panic, and its rider with madness. But for the sake of the house of Judah I will keep my eyes open, when I strike every horse of the peoples with blindness. Then the clans of Judah shall say to themselves, ‘The inhabitants of Jerusalem have strength through the LORD of hosts, their God.’ “On that day I will make the clans of Judah like a blazing pot in the midst of wood, like a flaming torch among sheaves. And they shall devour to the right and to the left all the surrounding peoples, while Jerusalem shall again be inhabited in its place, in Jerusalem. “And the LORD will give salvation to the tents of Judah first, that the glory of the house of David and the glory of the inhabitants of Jerusalem may not surpass that of Judah On that day the LORD will protect the inhabitants of Jerusalem, so that the feeblest among them on that day shall be like David, and the house of David shall be like God, like the angel of the LORD, going before them And on that day I will seek to destroy all the nations that come against Jerusalem. At Jerusalem, Satan will try to destroy God’s city and those who haven’t fled to Petra. It is here that the final battle will be, the remainder of Satan’s armies will be destroyed and Satan and Antichrist will be captured. Jesus is now ready to set up His throne here to reign on earth.